HP 48GB Kit with 6 x 8GB matched sticks. This fits many servers from Dell, IBM and HP. HP Part No500205-071. Pictures show the item and this is what you will receive. 9x8GB PC3-12800R 2Rx4 ECC REG Dimms. DELL Part Number R6JR0. 72GB for DELL Poweredge Servers. Founded in 1981, we are expert suppliers of new and refurbished HP IBM and DELL server hardware. Module Capacity 8GB. PC3-12800R 2Rx4 ECC REG. Founded in 1981, we are expert suppliers of new and refurbished HP IBM and DELL server hardware. DL380 G6: DL385 G7: DL580 G7: DL585 G7: DL980 G7: DL1000 G6. BL220C G6: BL280C G6: BL460C G6 G7: BL465C G7: BL685C G7: BL490C G6. DL160 G6: DL160 SE G6: DL165 G7: DL180 G6: DL320 G6: DL360 G6 & G7: DL370 G6. For HP Proliant Servers. Compatible with the following HP Proliant G6 G7 Gen8 Servers and Workstations. Founded in 1981, we are expert suppliers of new and refurbished HP IBM and DELL server hardware. Z620 Z820 Workstations. Z600 & Z800 Workstations with Rev C2 motherboard only. HP G6 G7 Servers and Workstations. DDR3 1333MHz. DELL Servers and Workstations. Precision Workstations. IBM Servers and Workstations. 2RX8 PC3L-10600R DDR3-1333MHz ECC Reg. Spare Part 591182-001 Assembly 460838-003 Version 3.04. IBM System x3620 M3 7376xxx. IBM System x3630 M3 7377xxx. IBM System x3650 M2 4199, 7947xxx. IBM System x3650 M3 7945xxx. Samsung Part Number 47J0157 Y. Spare Part 591182-001 Assembly 460838-003 Version 3.04. IBM System x3500 M2 7839xxx. IBM System x3500 M3 7380xxx. IBM System x3550 M2 4198, 7946xxx. IBM System x3550 M3 7944. 48GB (6x8GB). DELL PART NUMBER A5835245. Compatible with the following DELL Servers and Workstations. Founded in 1981, we are expert suppliers of new and refurbished HP IBM and DELL server hardware. Why buy refurbished hardware from RockHall?. PC3 -10600R ECC DDR3-1333MHz. F or DELL Servers and Precision workstations. DELL Part Number 2HF92, X3R5M, SNPX3R5MC/8G, A3002265. Compatible with DELL Servers and Workstations. DELL Poweredge Servers. F or DELL T7500 PRECISION Workstation. T5500: T5550: T5600: T7500: T7600. 16Gb 2Rx4 PC3 -12800R 1600Mhz ECC. DELL Precision Workstations. Compatible with the following DELL Workstations. Founded in 1981, we are expert suppliers of new and refurbished HP IBM and DELL server hardware. 2Rx4 PC3-10600R DDR3 1333MHz ECC. Speed DDR3 -1333MHz. Spare Part 591182­001 Assembly 460838­003 Version 3.04. Models 4.1 and 5.1 Early 2009 to 2012. Apple Mac Pro Workstations. Part Number 500205-071 Bus Type PC3-10600R. 48GB (6x8GB) for Supermicro Servers. Hynix manufactured. Suitable for many HP servers and workstations. We carry many other IT parts and systems so if what you require is not listed, let us know and we will list it for you. 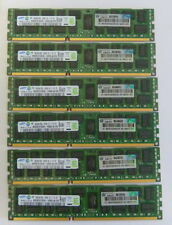 48GB (6x8GB Genuine HP Dimms). Compatible with the following HP Proliant G6 G7 Gen8 Servers and Workstations. Founded in 1981, we are expert suppliers of new and refurbished HP IBM and DELL server hardware. · Type: 240-Pin DDR3 Dimm. · Capacity: 8GB. We will try our best to solve any problems. Endding Soon. · Type: 240-Pin DDR3 Dimm. · Capacity: 8GB. We will try our best to solve any problems. Ruturn Policy. You can buy in set of 6 max. Ending Soon. New Arrivals. QUICK LINKS. we do not take any responsibilty after this. Why Choose Us! Compatibility DELL POWEREDGE R320 R420 R520 R610 R620 R710 R820. Every A-Tech ram module is tested for complete functionality before it leaves our doors. Give your computer the best, trust A-Tech! All of the components in our modules are sourced from the top manufacturers and only utilize new and new condition components. Speed: PC3-12800E 1600Mhz. Buffering/Ecc: ECC, Unbuffered. 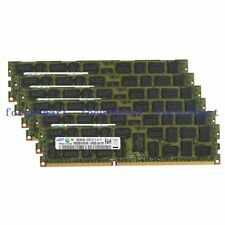 DDR3 For laptop. DDR3 for desktop. We will try our best to solve any problems. Ruturn Policy. SDRAM For laptop. Timings: CL9. Compatible with Dell PoweEdge C6100 M610 M610X M710 M710HD M910 M915. This will not affect functionality. Helpful Links. Compatible with HP PROLIANT DL320 G6 DL360 G6 DL360 G7 DL370 G6 DL380 G6. Helpful Links. Compatible with HP WORKSTATION Z800. Helpful Links. Z800 with Rev C2 motherboard only. DDR3 1333MHz. 8GB 2RX4 PC3 -10600R ECC DDR3-1333MHz. For HP ZSeries workstations. Compatible with HP Z series workstations (see below). HP Z series Workstations. Module Capacity 8GB. Compatible with DELL POWEREDGE R320 R420 R520 R610 R620 R710 R820. Capacity per Module 8GB. Manufacturer Third Party. Compatible with Dell POWEREDGE C1100 C2100 C6100 M610 M710 R410 R510. Helpful Links. Compatible with DELL PRECISION T5500 T7500. Helpful Links. Compatible with Dell PoweEdge C6100 M610 M610X M710 M710HD M910. This will not affect functionality. Helpful Links. Model:47J0136 / 49Y1415. Credit Card. Direct Debit. ALSO IN THE WHOLE. HAVE TO SERVER. Genuine HP. Removed from a working server. HP 1X8GB PC3-10600 DDR3 240-pin ECC. Dealz4TechUK is an independent distributor of computer hardware products for over a decade. We spot problems before they happen with the latest anti-fraud technology. PROLABS 8GB DDR3 PC3-10600 1333HMZ ECC 240 PIN. We Accept Only. Ending Soon. New Arrivals. QUICK LINKS. we do not take any responsibilty after this. you can buy in set of 6 max. Why Choose Us! Ecc,buffered. 5.5" New For Elephone P8 2017 Black LCD Display Touch Digitizer Screen Assembly. For HYPERX KIT 8GB 2x4GB DDR3 1866MHz PC3-14900 Desktop DIMMRAM Erinnerung 1.5V. ORIGINAL 5.2" AMOLED LCD for SAMSUNG Galaxy J5 2016 Display J510 Touch Screen. Ecc,buffered. AMOLED LCD Display Touch Screen for SAMSUNG Galaxy J7 Pro J730 J730F J7 2017. For HYPERX KIT 8GB 2x4GB DDR3 1866MHz PC3-14900 Desktop DIMMRAM Erinnerung 1.5V. For Dell Venue 11 Pro 7130 7139 DC IN MICRO USB HDMI BOARD CABLE 69NM0NB12E02. Ecc,buffered. Desktop speicher 1866MHZ SO-DIMM for Hyperx 1.5V 240pin PC3-12800 NEW RAM . Cache Latency: CL5. Add to Favourites.